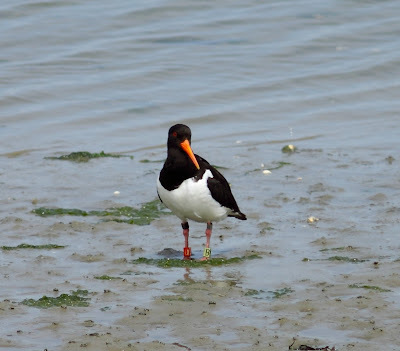 An afternoon visit to both breeding colonies of Oostende and Zeebrugge today, with a total of 43 rings! Many of these were juvenile birds, some of them not yet able to fly. Now I hope to see some of the young birds of today later on in autumn/winter! Sadly, also several dead birds, most of them because of traffic... Three of the dead juvenile birds were ringed, of which one with a colour-ring. 4th cal Herring gull blue CJ.AK (E Stienen), Oostende. Adult Herring gull blue M.KAD (E Stienen), Oostende. Juvenile LBBG blue TNA.P (E Stienen), Oostende. Part of a colony in Oostende. Juvenile Herring gull blue S.HAD (E Stienen), Zeebrugge. Juvenile Herring gull blue SC.AP (E Stienen), Zeebrugge. Juvenile Herring gull blue SBA.L (E Stienen), Zeebrugge. Juvenile Herring gull blue S.AAX (E Stienen), Zeebrugge. Juvenile LBBG metal Brussel L915714, killed by a car or truck..., Zeebrugge. Adult Herring gull blue FMA.W (E Stienen), Zeebrugge. Adult Herring gull blue CUA.D (E Stienen), Zeebrugge. Last weekend I went to Vlissingen-Oost, where Roland-Jan Buijs has ringed many gulls in the previous years (and also some young birds this year), in order to see some of these birds. Not as succesfull as last year in May (when I read >80 rings), but I was happy with every ring I could read. In the nearby port I could read some Oystercatchers too, and a Belgian-ringed Herring (metal ring) was at Westkapelle. Herring gulls in the colony of Vlissingen-Oost (Quarleshaven). Herring gull yellow R5 (RJ Buijs), Vlissingen-Oost (Quarleshaven). Herring gull yellow MJ (RJ Buijs), Vlissingen-Oost (Quarleshaven). Pair of LBBG's, Vlissingen-Oost (Quarleshaven). Herring gull Brussel H161237, Westkapelle. Each bird has one tag on each wing, with different tags on the left and right wing. The colours used are white, yellow, orange, purple, red, green and blue, and the symbols (which can be black or white) are X, -, I, /, 0, 8, a full dot and a triangle. Some tags have no symbol. 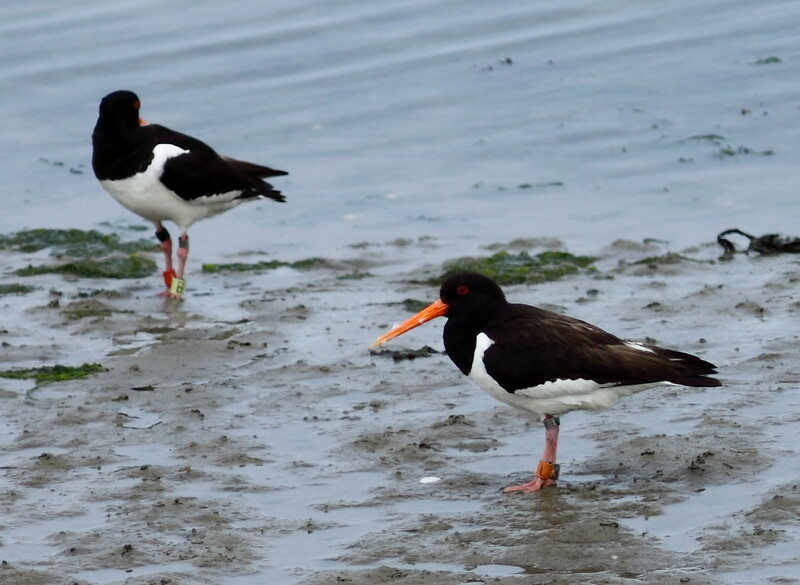 The first birds have already left their nests, and are flying around, so keep your eyes open for these birds! It will be very interesting to see if some will be recored in southern Europe this winter. 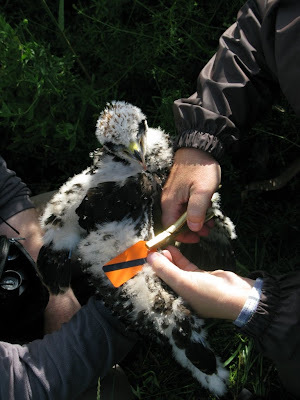 Young Marsh harrier with left wing-tag visible (white X on blue). 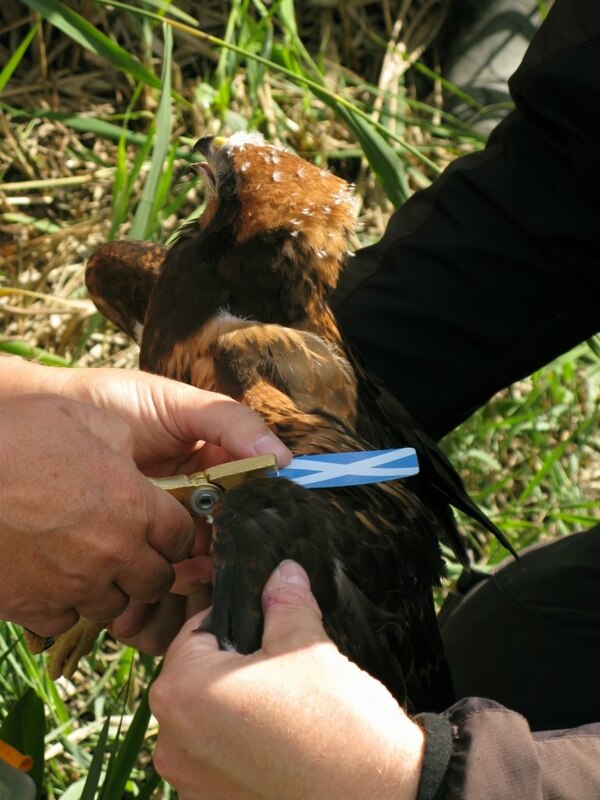 Young Marsh harrier with wing-tag (other bird than above) with right wing-tag visible (black / on orange). Last week I did 2 attempts to see Belgium's 3rd King eider, in which I unfortunately did not succeed. Since I was in the harbour of Zeebrugge, where our largest colony of large gulls is located I tried to read some rings and take some pictures. All birds seen were locally-ringed. LBBG blue MMA.B (E. Stienen). LBBG blue LZA.R (E. Stienen). LBBG KY.AL (E. Stienen), this bird had a problem with its right leg. LBBG blue DB.AL (E. Stienen). Herring gull bue GDA.J (E. Stienen).